Everyone has heard of Bill Gates and Steve jobs, right? These two men are modern giants of computer science. What many of us rarely or never recall is the contribution of women in this field. Augusta Ada King, Countess of Lovelace is one of those amazing women of history that we all should be aware of, especially her contribution to mathematics, logic and the early history of computers. She was born almost two hundred years ago, on 10th December 1815, as the only daughter of Lord Byron, one of Britain’s greatest poets and his wife Anne Isabelle Byron. Ada’s mother despised her father Byron so much, that she had Ada educated in mathematics to spite him. Ada’s mother had hoped that by channeling Ada’s talents towards mathematics, it would alleviate in Ada her father’s fondness for poetry and compulsions. It unfortunately didn’t, Ada remained interested in him until the very end (She died in 1852). She inherited many of his compulsions. She was often associated with loose relationships with men other than her husband and her addiction to gambling. In spite of this oversight, she was otherwise a very driven individual in a field of study (mathematics) that not many women excelled in. At the age of seventeen, she became friends with Charles Babbage, a mathematician and inventor, and grew fascinated by his idea to build an “Analytical Engine”. He only envisaged it as a calculator, but Ada realized the engine could represent more than just numbers with a wider potential. In 1843, Ada published a description of Babbage’s machine with extensive notes for how the machine might calculate a sequence of Bernoulli numbers (in collaboration with Babbage). This conceptual leap became the basis of the world’s first process or set of rules to be followed in calculation, very similar to how we use computers today. Furthermore, she hypothesized that the ‘Analytical Engine’ could likely be used to compose “elaborate and scientific pieces of music of any degree of complexity or extent.” If this is not visionary or inspirational, then I don’t know what is? 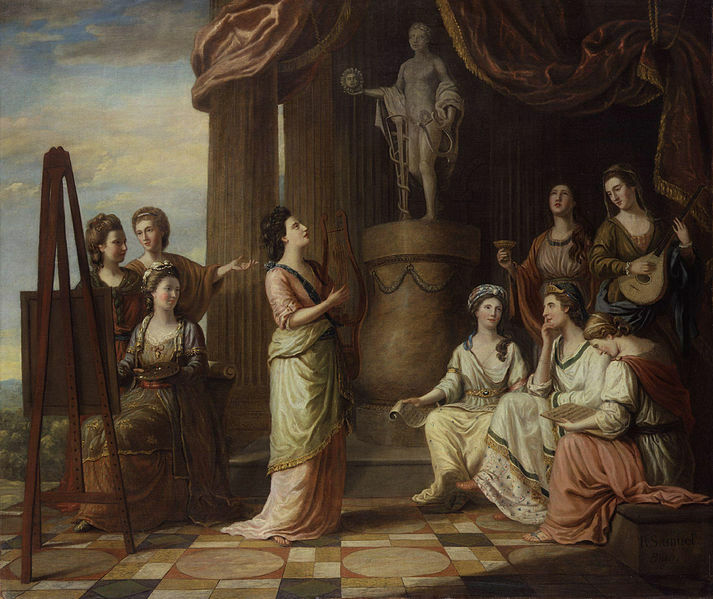 Elizabeth Montague sits with her hand on her chin in Richard Samuel’s ‘Portrait in the Characters of the Muses in the Temple of Apollo’ 1778. I must confess I had no real idea of who Elizabeth Montague was until a good friend of mine suggested I look at her for this series. I was pleasantly surprised to find out what an inspirational women she was, particularly in the field of education. She was also I believe ahead of her time as a social reformer. One has to say though, if it wasn’t for her considerable wealth, would she have left such an overwhelming legacy in education and the relief of the poor ? What cannot be disputed though, is her devotion to literature and abilities as a writer and critic. There is nothing new I can add or write about that hasn’t already been said about Elizabeth. Her amazing life speaks for itself and has often been the subject of many University dissertations, particularly her correspondence and letters with British Enlightenment coteries. Many British libraries hold some of the most important letters that she wrote. The Huntington Library, in California, USA also has a sizeable collection of her letters. Elizabeth Montague’s enthusiasm for English and Scottish literature was second to none. She was a ‘celebrated hostess’ and founding member of the Bluestocking Society. It was a literary discussion group of privileged women that often also invited many leading and otherwise educated men to participate. Interestingly, the bluestock society was revolutionary for its time. The old stereotypes that a woman’s place was in the home were being broken down by Montague and her fellow female companions through this literary group. In many ways Montague’s society was an advocacy group for the amelioration of women. It was also a support network where members supported each other through reading, artwork and writing. This article from Robert Horvat’s blog is not only interesting in its own right, but has a personal connection to me. While I was at the Huntington Library in June I met a British researcher who was working on the letters of Elizabeth Montagu, and from her I learned what a fascinating woman she was! The “friend” who alerted Robert to her as a possible blog subject is my husband. I had to share this article about two very fascinating ladies of the 18th and 19th century. Constans: champion of the Trinity or enemy of Gaul ?